When Mole decided to go to the river bank one morning rather than do his spring cleaning, it was the beginning of a magical adventure. Meeting Ratty and Mister Toad of Toad Hall, Mole’s journey into life above ground and the friends he meets is quite charming, but it’s a rather different story when he stays underground. 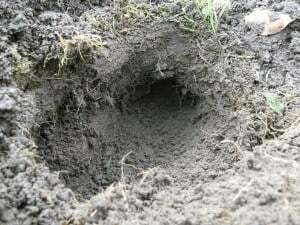 With curved front paws and claws that dig like shovels, moles can dig up to 6 metres in one hour and can tunnel up to 20 metres a day. 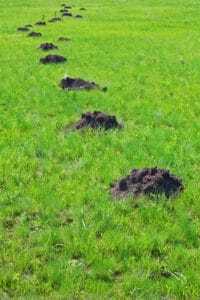 They leave characteristic mounds of earth on the surface and although the molehills aren’t mountains, they are considered pests by gardeners and farmers alike. Moles are found in North America, Europe, Asia and even parts of Africa, although not in Ireland. They live where the soil is deep enough to allow tunnelling and are uncommon in coniferous forests, moorlands and sand dunes. 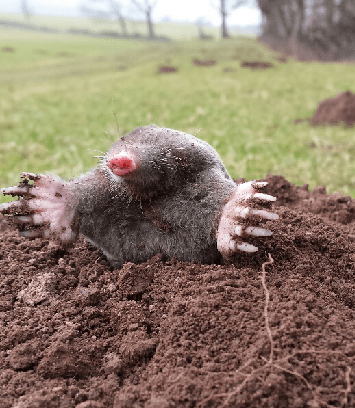 The thought of us crawling around in dirt all day is distinctly unappealing and with good hearing but poor eyesight, moles spend almost all their lives underground in a system of tunnels working all year round to find food. Their preferred diet is earthworms and each day they will consume more than half their body weight in worms. In a year they will eat over 20 kilograms of these tasty morsels and they will collect and store them in special chambers for later dining – up to 500 of them could be found in one of these stores. Moles will also snack on insect larvae, particularly in the summer, with worms dominating the winter diet. They live the life of Billy no Mates, with males and females living a solitary life for most of the year. The start of the breeding season, in early Spring, sees males enlarging their territories over large areas in search of females. In their endeavours to meet Mrs Right, they will construct spherical nesting chambers, each lined with dry plant material. 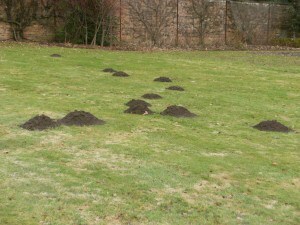 The moles will then sleep in them, raising their young, typically a litter of 3-4. By the time they are a little over a month old they start to leave the nest. This takes place above ground when they are at risk from other predators including owls and hawks. Cuddly though they appear, the moles’ surface tunnelling in gardens and newly planted fields can disturb plant roots causing them to wilt and die. Stones excavated to the surface by moles can also damage expensive harvesting and ground maintenance equipment. Contamination of grass used to make silage and the loss of valuable pasture land because grass wont grow are just 2 further problems our small cuddly friends cause. Parkland and golf courses are not immune from moles and their tunnels and molehills can be as hazardous as bunkers! That’s why we have a range of services that will provide the solution you’re looking for. So, if you have uninvited guests and would like help and advice on how to tackle the problem, give us a call on 0800 0283 703 or complete our on-line contact form.